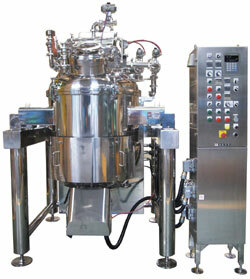 One-batch processing for breaking down/emulsifying/mixing/heating/cooling. Using one machine to perform a series of processes - heating/cooling/mixing/breaking down/emulsifying/temperature measurement, etc. under normal atmospheric pressure / vacuum greatly shortens production time and deaeration to attain sterilization/energy saving/cost saving. 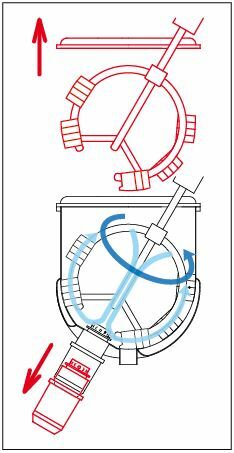 As the cutter unit is located at the bottom of the kettle, it is capable of emulsifying even small volume products. Also, the oblique mixing blades are capable of good horizontal blending, which widens the range of optimal quantity for production. Forward/backward rotation of the oblique mixing blades cuts through inertia and promotes smooth mixing / blending. This also makes it difficult for ingredients to stick to the mixing blades. Dressing, Mayonnaise, Dips, Sauce, Juice,Flour paste, Paste type food, Baby food, Food for persons who need care, Cosmetics, and other viscous materials.